Times may be tough, but you don't need to pull a Grinch and retreat into your snow cave. We found 14 eco-friendly gifts to knock out everyone on your holiday list without hocking a kidney. And, at $25 and under, you can even afford to hoard a few for yourself. 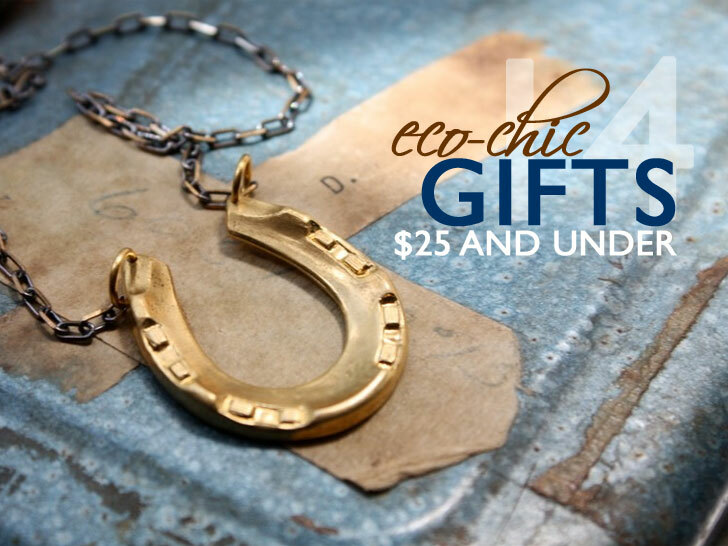 Above, a vintage horseshoe necklace by Brooklyn designer Christine Domanic, nicely priced at $24. For a knuckle-buster with serious flair, pile on The Andean Collection’s “Mesa” ring, which features a geometric plateau derived from sustainably harvested Tagua nut. Always forgetting your reusable bag at the store? Harness some of the elephant’s legendary memory with Baggu’s lightweight nylon daypack, which folds into its own pocket for stowing away in a purse or glove compartment. 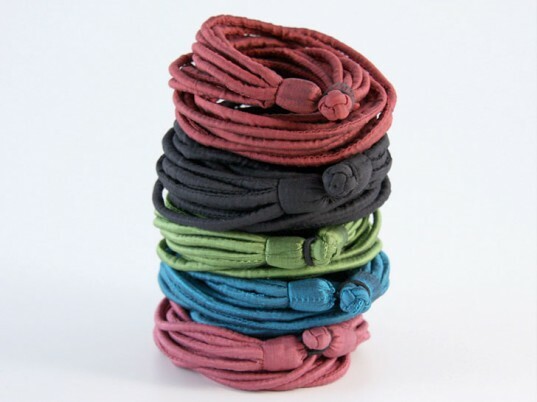 Whether looped across your collarbones or wrapped around a wrist, these artisan-made silk strands from Vietnam are the epitome of understated elegance. Relive the halcyon days of the humble mix tape with a zippered clutch made from a shimmering blend of reclaimed cassette ribbon and cotton cord. 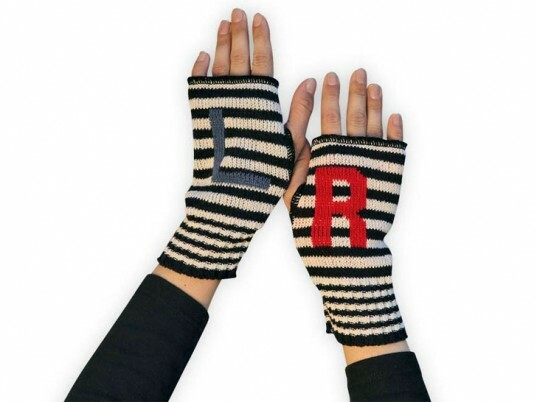 Know left from right with a pair of stripy hand-warmers, fairly knit in upstate New York from salvaged cotton upholstery scraps. 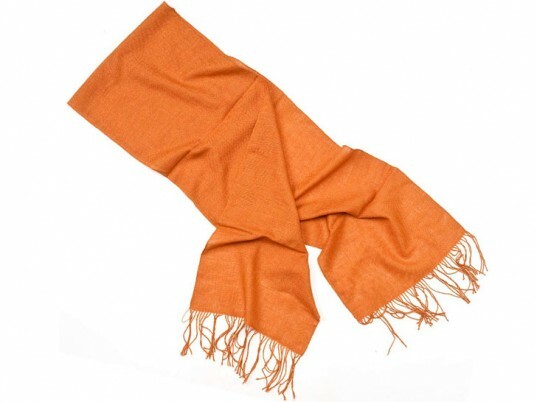 A lightweight woven scarf for all seasons, Indigenous Designs’ organic-cotton stole offers a burst of color to punch up even the most anemic wardrobe. Fluffyco paired organic cotton with hemp and triangles with faux bois to create a billfold so wallet-friendly, you’ll be left with something to put inside. 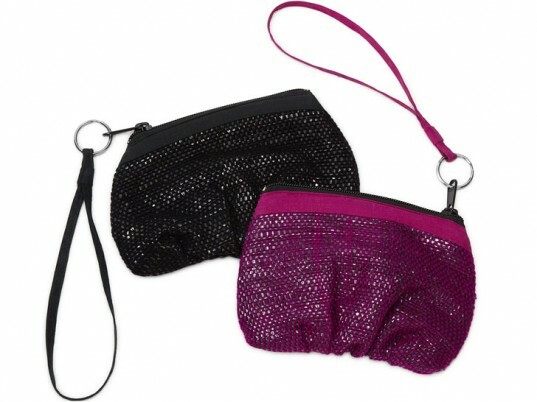 All this talk about belt-tightening wouldn’t be complete without a waist-cincher to keep your pants up. Archival Clothing’s economical take hails from Oregon, where it’s ethically made using U.K. cotton webbing and American-tanned leather tabs. Help feed the world’s hungry children with FEED Projects’ ethically made ikat-print “Guatemala” pouch, which provides five school meals through the United Nations World Food Programme with every purchase. Threadbare socks are nobody’s friend. Put a spring back into someone’s step with Zkano’s Alabama-made organic-cotton socks, which come in several toe-tapping color combos for seriously happy feet. From mother-daughter duo Shelly and Mary Klein comes an embroidered slipcover to swaddle your iPad in style. 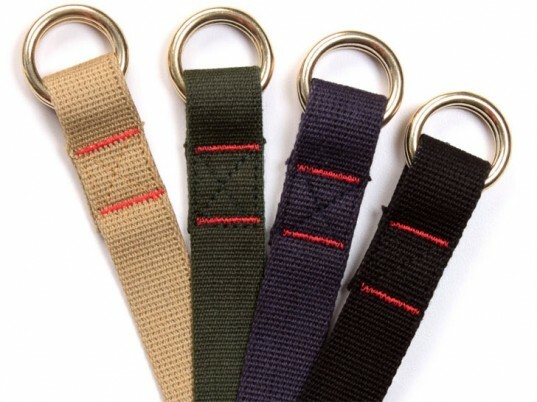 Handmade from a blend of hemp and cotton in Grand Rapids, MI, each case features a series of hand-drawn faces, plus cotton batting to protect your precious cargo. Nobody deserves coal in their stocking, let alone their communities. PACT’s “Beyond Coal” line of organic-cotton undies supports the Sierra Club Student Coalition’s “Campuses Beyond Coal” initiative, which educates the public about coal’s danger to environmental and public health while advocating for cleaner fuel sources. Who doesn’t love a good brain-teaser? Get your rocks off with a puzzle-piece “tangram” ring made from recycled birch plywood and laser-cut melamine. For a knuckle-buster with serious flair, pile on The Andean Collection's "Mesa" ring, which features a geometric plateau derived from sustainably harvested Tagua nut. Always forgetting your reusable bag at the store? 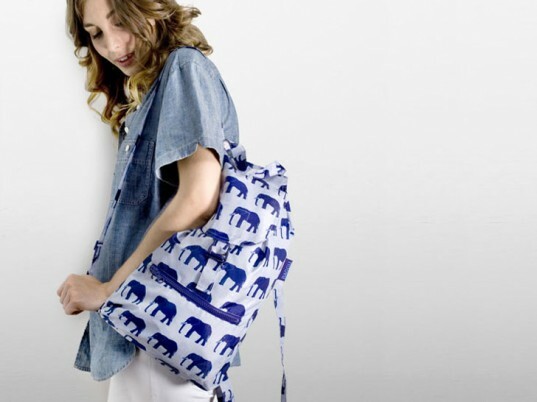 Harness some of the elephant's legendary memory with Baggu's lightweight nylon daypack, which folds into its own pocket for stowing away in a purse or glove compartment. A lightweight woven scarf for all seasons, Indigenous Designs' organic-cotton stole offers a burst of color to punch up even the most anemic wardrobe. 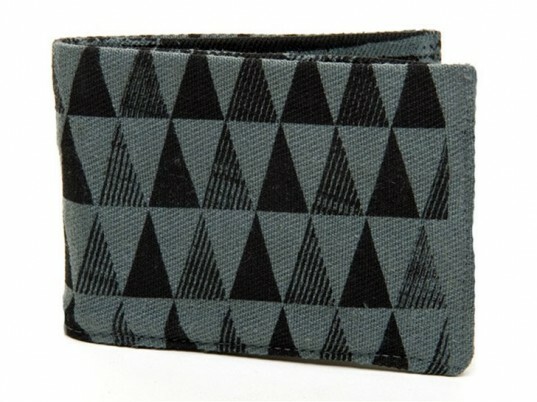 Fluffyco paired organic cotton with hemp and triangles with faux bois to create a billfold so wallet-friendly, you'll be left with something to put inside. All this talk about belt-tightening wouldn't be complete without a waist-cincher to keep your pants up. Archival Clothing's economical take hails from Oregon, where it's ethically made using U.K. cotton webbing and American-tanned leather tabs. 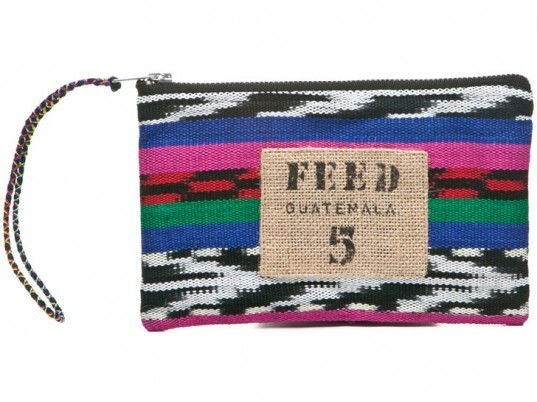 Help feed the world's hungry children with FEED Projects' ethically made ikat-print "Guatemala" pouch, which provides five school meals through the United Nations World Food Programme with every purchase. Threadbare socks are nobody's friend. Put a spring back into someone's step with Zkano's Alabama-made organic-cotton socks, which come in several toe-tapping color combos for seriously happy feet. Nobody deserves coal in their stocking, let alone their communities. PACT's "Beyond Coal" line of organic-cotton undies supports the Sierra Club Student Coalition’s “Campuses Beyond Coal" initiative, which educates the public about coal's danger to environmental and public health while advocating for cleaner fuel sources. Who doesn't love a good brain-teaser? 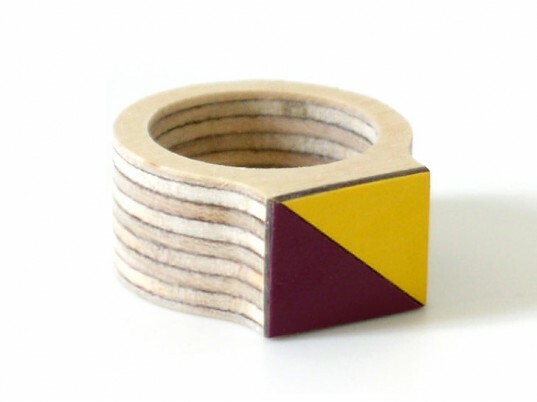 Get your rocks off with a puzzle-piece "tangram" ring made from recycled birch plywood and laser-cut melamine.